An eight foot high log crib wall revetment structure was installed along a 40 foot section of streambank located on the Bailey property. Construction of this wall prevents additional scouring of the severely eroding streambanks caused by heavy flow events and replaces a formerly existing, insufficiently anchored retaining wall on the Bailey property. A stair-step placement of BioLogs was installed along the adjacent Shipley and Davis properties to prevent additional erosion from occurring upstream and downstream of the Bailey property. The BioLogs (coconut fiber-filled logs, aka, coir logs), were installed along the current contours of the streambank to stabilize and armor the streambanks from heavy stormwater runoff events. Native woody vegetation were planted on the streambanks to promote additional bank stabilization and provide habitat for fish and wildlife. The lowest level of BioLogs contain native aquatic vegetation to promote water quality improvement through their water filtering abilities. BioLogs were installed on the Shipley property, located upstream to the Bailey property. These logs were tied in to an existing railroad tie structure located at the upstream boundary of the Shipley’s property, and extend approximately 89 feet downstream to reach the Bailey property. At the Bailey property, the BioLogs were tied into the log crib wall structure to form a continuous streambank protection structure. On the Davis property, located adjacent and downstream of the planned 40 foot log wall, BioLogs were installed for an additional 74 feet to continue streambank protection through the stream curve and prevent scouring downstream of the cedar log revetment structure. A silt barrier was installed downstream of the construction site. Footer trenches, approximately 2 feet wide and 7 feet long, were excavated every 8 feet along the streambank, 1 foot below the streambed. Footer logs were installed on top of the rock and fastened into place with rebar. Additional rubble rock was placed around the base of the footer logs. Cover logs were installed by positioning the joints over the footer logs and fastening to footer logs with spikes. 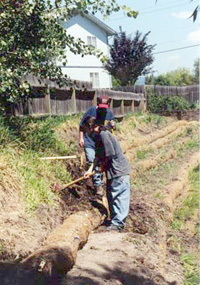 Trenches were dug for the tie logs, the tie logs were installed, then the tie logs were attached to the cover log using spikes or rebar. Face logs were cut and placed in position between the tie logs, then fastened to cover logs with spikes. Filter fabric was placed against the revetment, stapled to the logs, then backfilled with rubble rock and fill soil (rubble rock on bottom, fill soil on top). Disturbed soil was reseeded with grass to prevent future erosion. Woody vegetation was placed along the revetments steps to provide additional stabilization to the bank and increase fish and wildlife habitat along the creek. Grass were weed-whacked along the construction area. Volunteers and PCEI staff using hand tools reshaped the banks to form smooth shelves wide enough to install 10-inch-diameter coir logs. For each step, coir logs were placed and anchored end to end along the streambanks to form a continuous line of BioLogs. Wooden stakes, approximately 2.5 feet in length, were pounded into the coir logs approximately every 2 feet to anchor the logs into place. Disturbed soil were planted with a riparian herbaceous seed mix. Native woody vegetation were installed along the upper steps to promote streambank stabilization, shade the creek, and to provide habitat for fish and wildlife. 6 -12 in. diameter riprap was used at the junctions of the coir logs with the log crib wall revetment structure and the railroad tie structure to tie in the stabilization structures at the transition areas. 6-12 in. diameter riprap was also installed at the base of the BioLogs installed along the stream curve to help protect the toe of the streambank slope. Before Picture: An excavator takes a bite to begin construction of a stepped log wall revetment structure. Cedar Revetment Terraces in Progress: Neighborhood volunteers work to complete stepped log crib wall. BioLog terraces in background. BioLog Terrace in Progress: Two high school students reshape the streambanks and install a coir log terrace. These youth worked with PCEI under a local job training program that enables teenagers to acquire work skills and experience years prior to high school graduation. Wetland Plants Grow Right in the BioLogs: AmeriCorps*NCCC members maneuver a coir log in place to create a streamside living terrace using coir logs planted with wetland plants (lower tiers) and woody vegetation planted along the upper tiers (not shown). The terrace will stabilize the streambanks; planted woody vegetation will someday shade and cool the creek.